The primary purpose of the Milestone task is to set the overall status for a process. Each time a Milestone is executed within a request, it will update the current status for that particular request on a user’s dashboard. When this process executes, a user would submit their vacation request form and then the Milestone would execute setting the Request’s status to 'Pending Approval'. Then, an Approval task would be initiated and assigned to a manager. The Milestone task is also unique in how it may be used within a process. If no recipient is added to a Milestone task, then Integrify will just execute the task automatically. However, it is possible to use a Milestone task as a logical decision point in a process and assign it to an individual. By doing so, you can add multiple options to the Milestone configuration and allow that user to select which particular status should be the current status such as Pending Testing, Pending QA, or any other status you would like to display. When a Milestone task is added to a process, by default, the name given to the Milestone task becomes the default value. In turn, that default value becomes the current status for your Request when the Milestone is executed. Here, you may add or remove a new status. Note: It is possible to have the task name “Pending Approval” and then change the default configuration to be “Approval Is Pending” but for clarity, it is best to keep the task name and the default configured value the same. You do not need to add a recipient to the task. If a recipient is not added to the task Integrify will execute it automatically and the default value will become your current status. A second method for using a Milestone task is to allow a user to manually set the status of a request. The user assigned to the Milestone task will have to decide which option to select and move that process down that particular path. 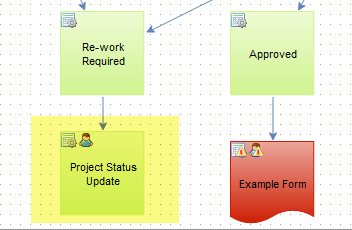 By using a Milestone task in this manner, it allows a user, such as a project manager, to manually control both determine how the process flows and control the status that is displayed to the end user for the request. Additionally, in the above scenario, after each task is completed such as Development Form, the Project Status Milestone is again started so it is possible to loop through the same series of tasks like Development Review several times if the work is not completed correctly.